Our J has been flying long-haul since he was 4 months old. He has clocked more air miles in his four years than I did in my first three decades of life. This makes him a seasoned flyer and me, by extension, quite the pro when it comes to handing out advice on flying with children. Here are my 8 travel hacks to make life easier when flying with children. So you have planned a holiday and booked your flights. Next step, choosing the right seats to make sure your little ones, you, and everybody else on the flight have a comfortable journey. If you are flying with a baby, check to see if the airlines you have chosen offer bassinet seats. These are a life-saver, believe you me. They will save you juggling baby, food, inflight entertainment, all in the crammed confines of an economy seat. Who knows, you might even get to catch a few winks while the little one sleeps in the bassinet! Importantly, these seats tend to be near the toilets/pantry, so you have easy access to essential commodities at all times. If you are flying with slightly older children, try and ensure you get those sought after window seats. One each for each of your children, if at all possible, even if it means splitting up over two rows. Last thing you want is a squabble over who gets to peer out at floating clouds. 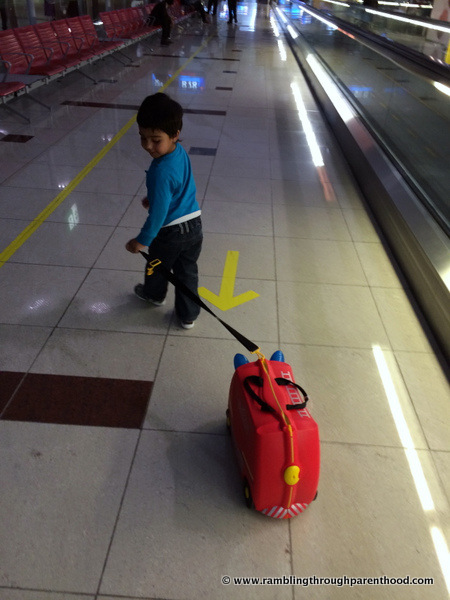 Get your kids to help pack their own carry-on luggage so they can choose what goes in. Within limits, of course, or you might end up carrying half your home on holiday. This way, there will be no tears later for that teddy that got left behind or the missing book. If there are, you can at least hold up your hands and deny all involvement. Ride-on suitcases like the Trunki are a life-saver. Not only are they gorgeous in design, they can make traipsing around the airport a lot more interesting. It is infinitely better to pull along a toddler astride a Trunki than to coax/carry/drag a howling, screaming, whining one from one airport terminal to the next. Choose a back-pack as your cabin bag. Gone are the days of trendy designer handbags, it is all about efficient ergonomics now. You will need both hands free at all times. Fact. Carry lots of everything in your hand-luggage: nappies, nappy sacks, wipes, snacks, essential prescription medication. Do not underestimate the power of your child's bowels when it comes to packing nappies. Go over by at least half a dozen, if not more. Remember to pack a change of clothes for you too in case of those super-explosive poos and pukes. Important: Infant milk is allowed in your hand luggage. You are the best judge of what your child will or will not eat. That is why you are packing those snacks (see above). But most non-budget airlines will offer you the option of booking a child's meal. It is usually something along the lines of chicken nuggets, chips and ice-cream, but it seems to do the trick. A quick heads-up here - some airlines require you to make the meal selection at the time of booking tickets. So please make sure you have. Or else get on the phone to airline customer services to avoid nasty surprises later on. If your little ones are not yet riding their Trunkis, but are still in strollers, this one is for you. You are usually allowed to take your stroller all the way up to the aircraft, where they will then stow it away. But most times, the stroller will only make an appearance on the baggage carousel after landing, leaving you carrying your child in your arms from the aircraft, through immigration and all the way to baggage claim. This can be quite a walk, especially at some large international airports. Request the check-in desk for the stroller to be handed over to you at the aircraft door on arrival. Most will oblige. There are a few airlines and international airports that offer free strollers for use in the terminals. So check if your airline is one of them. The pressure in our ears changes compared to outside air pressure when an aeroplane climbs up during take-off or descends to land. That is why our ears pop. These popping ears can cause discomfort, even pain, in both children and adults. Something as simple as chewing a piece of gum or sipping a drink or swallowing your own saliva can prevent these pressure changes and the subsequent ear ache. So do offer your baby or child a drink during take-off and landing. Their ears will thank you for it. The most crucial part for parents during any flight is how to avoid the invariable, "I am bored," followed by the inevitable melt-down. Again, you are the best judge of your child's attention span and entertainment favourites. Most long-haul flights will offer a selection of in-flight entertainment. If not, be prepared to make your own. If your child has a favourite phone app, make sure it is downloaded prior to take-off. Don't hesitate to use it for the duration of the flight if you have to. Remember, this is not the time to enforce screen-time limits. Pack a few little surprises in your own hand-luggage and pull them out at regular intervals to keep up the interest. Pound shop stash works brilliantly for this. Sweet treats, sticker activity books (don't forget the crayons), travel games work well with the younger ones. You heard me, some major carriers offer you the services of a nanny even in economy class. Last I checked, Etihad Airways and Gulf Air offer this service. Use their help if you have to, if only to finish your meal and visit the toilet! So there you have it. My top tips to make flying with kids just that bit easier. Holiday Extras, the UK’s market leader in travel add-ons, is offering one lucky reader the chance to win an adorable Tipu-the-Tiger Trunki. As I have already mentioned before, Trunki is an exciting ride-on suitcase that will keep your child entertained throughout the airport. It is specifically designed to beat the boredom of travelling tots. Offering a range of travel add-ons such as airport hotels with parking, airport lounges, car rental and much more, Holiday Extras specialises in making travel easy. So, whether you’re up against an early flight or the summer crowds, it’s sure to offer a family-friendly solution to your holiday hassles. Disclaimer: I have not received any compensation to write this post. All opinions are my own. Those bassinet seats are great for extra legroom and space, but we struggled to get our (then) 10 month old to settle into it and he ended up sleeping on me. This is a great set of tips for flying with kids. Looking back, I don't know how my mum managed with four of us on one flight!! Fab giveaway. 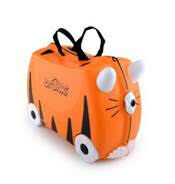 I am actually considering getting a Trunki for the little one; I think he would love it. Great advice, and what an awesome giveaway - Boo loves her trunki!! These are all great tips. I didn't know that in-flight nannies existed - what a very clever idea! this is fab advice didnt know such a thing was available!!! excellent tips we have yet to fly with our children! There is so much to think about! So glad I read this post... I'd love to take my boy on his first plane holiday, but confess to being a bit nervous... Love the advice here- thanks! And I've always loved Trunki's...which kid (and big kid, let's be honest) wouldn't adore their own special luggage like this! Oh wow, I didn't realise some flights have nannies!! Great tips, now mine are older they love airports and flying but we do suffere with ears. 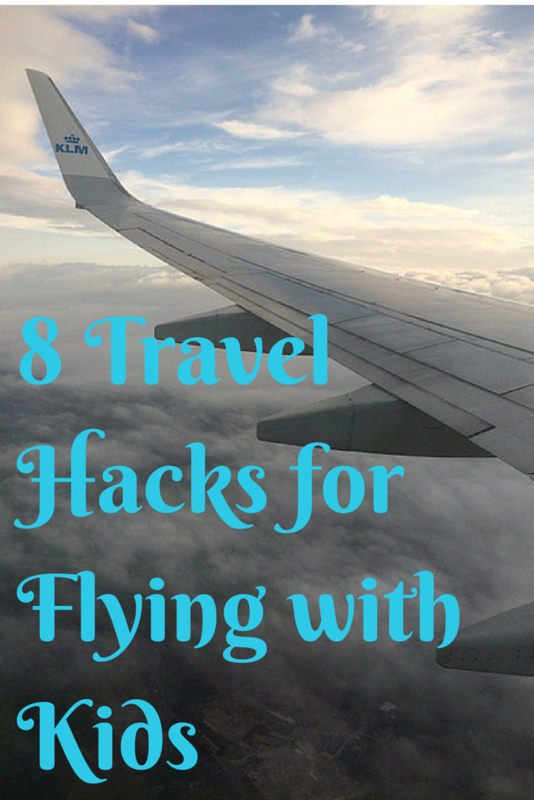 Some great tips - my kids love flying! Love Trunkis too! Thank you, Lynsey. I am glad you enjoyed reading my tips. Thanks for stopping by, Teresa. I am glad you found these tips useful. I've had some flights that I would have loved a nanny during. Trans-Atlantic flights with an infant/toddler can be so draining (especially with unforeseen weather delays and cancellations). Any long-haul flight can be exhausting! I think the flying nanny is a relatively new concept, one that major international airlines should pick up on. Great post! The best way to make your journey successful with kids is to keep them busy as much as you can.